device oder media for example harddisc, cd-r or audio-cd. please read the manual before using DevInfos! - some guys from the support forum "OS4Welt.de" for there ideas. - m. zamora for the spanish translations. - Elwood for the french catalog and many suggestions. - Corrects two error, which will maybe call the grim. - DevInfos now recognize SMART-Status and let it in the state where it found it. - now supports floppy's i hope. - the size of a device with less then 1gb is shown in mb. - Tooltype Speedtest to switch off the test-tab. - Tooltype Device. if it is set, this is the only device which is shown. - Devicelist now only refreshed, when it is needed. - Some correction in filesystems names. - Correct some bugs by generating the version string. 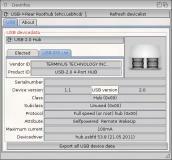 - Now Devinfos resets his GUI, when removing or installing a new device. - Remove a bug, which is maybe generating reaction problems. - Change some API-Calls to the new SDK functionnames. - DevInfos Manual now also in swedish. - A manual directory with a little manual in differend languages. - all exports are now in csv-format, unless you can configure the export. from HelmutH, graphics created from mason). - some new layouts in the tab to make it work fine with translations. - smash a bug in the usb-code, now shows the correct protocol of the devices. - New ToolType Protocol, which controls the new protocol option. - Writes a protocol-file with all displayed informations, when Tooltype is "On". - extended some information about ata/atapi versions. 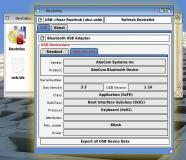 - new routine for the extraction of idetool-data from idetool output. - some minor updates for Device Data informations. - Uses c:idetool to show transfermodes of a device. - dynamic control of the window height is reimplemented. - minor bug correction in s.m.a.r.t. tab. - Compacts the Gui from Devinfos. - corrects some problems with the gui and brings some minor new infos. - about text changes to "Needs smartctl in c:".